Caring for the congregation is more than any one person can do, even the pastor. All persons eventually experience grief and loss, crisis and suffering; and many come to church for the first time as a result of needing help. Using this four-session study, modeled after The United Methodist Church of the Resurrection in Leawood, Kansas, churches can form an effective team by addressing four key areas of congregational care: prayer ministry, support ministry, hospital visitation, and grief and death ministry. 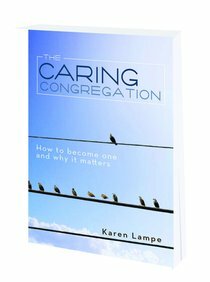 Karen Lampe says congregational care should be modeled after the ministry of Jesus, who offered compassion, understanding, healing, and wholeness as a way of offering God's redemptive gift of grace. Congregational care is one reason, according to pastors Adam Hamilton and Karen Lampe, that their church is successful in attracting and keeping new members. In each richly illustrated session, readers will find inspiration, Bible-connection, skill building, practical tips, and resources, including: information about anointing, helpful scriptures, application forms, suggested requirements and application for team member, a volunteer leader covenant, safety and self-care contract, and a counseling guide. Karen Lampe is the Executive Pastor of Congregational Care at The United Methodist Church of the Resurrection in Leawood Kansas and serves in conjunction with senior pastor, Adam Hamilton. Rev. Lampe received her undergraduate degree from Kansas University and a M.Div. from Saint Paul School of Theology. She is active in district and conference activities, having served the United Methodist Women as district president and conference vice-president. Rev. Lampe currently serves on the Kansas East Conference Board of Ordained Ministry.